Enjoy our famous Mountain Body Hand Treatment Set in travel sizes! Great to introduce a friend to the delight of soft hands or to use yourself. Includes 2 oz. Mountain Sweet (Sugar), Honey Butter, Moist Aloeva Lotion, and .25 oz. Mountain Balm. The easiest way to soft hands! Includes: 2 oz. 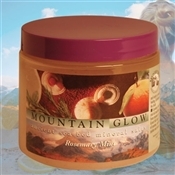 Mountain Glow or Mountain Sweet, Honey Butter, Moist Aloeva Lotion, and .25 oz. Mountain Balm.The easiest way to soft hands! Includes: 2 oz. Mountain Glow or Mountain Sweet, Honey Butter, Moist Aloeva Lotion, and .25 oz. Mountain Balm. Mountain Body Products | Handmade Artisan Soap Mountain Body Products | Mountain Glow Mineral Salt Scrub -16 oz. - Rosemary Mint Mountain Body Products | Tropic Blended Massage & Bath Oil - 4 oz. Mountain Body Products | Mountain Sweet Sugar Scrub - 32 oz.